If you want to acquire your own trike, but don’t have a handy trike shop in your neck of the woods, do not worry. Help is as near as your computer and telephone! Many of us are not lucky enough to be able to drive to a local trike dealer, take test spins on various models, and choose a trike based on first-hand riding experience, so we must research it all online, call the trike shops, and talk to those who already have a trike. Here are some places to start your search for that new trike. These well-known recumbent trike dealers have good reputations, helpful staff, and various ways to get a trike delivered right to your doorstep in short order. Most of these dealers have physical stores that you can visit in person to test ride their trikes. They are listed alphabetically for your convenience. ALPHABENT – fun, health, and adventure … on your trike! Hugh and the staff at AlphaBENT / PBW know human-powered cycles from the inside out and have the experience that can only come from many years of hands-on mastery helping people across the globe achieve their goals of having FUN, HEALTH, and ADVENTURE riding. See you soon! 2013: Peregrine Bicycle Works moved the Dixon shop into downtown Sacramento where it has made a permanent home at 1114 C Street. PBW began using the moniker AlphaBENT to reflect its leading position in the recumbent market. AlphaBENT / PBW is a Premium dealer for ICE and HP Velotechnik, and enjoys the enviable position of being one of the very few Catrike Concept Stores in the world. 2010: PBW made its first expansion starting a shop in Dixon, CA midway between San Francisco’s Bay Area and the Sacramento Capitol City. The business expanded quickly as the recumbent trike revolution continued. 2007: Within a few years of selling the first Greenspeed GTO touring trike, the recumbent trike business became the primary focus of Peregrine Bicycle Works. 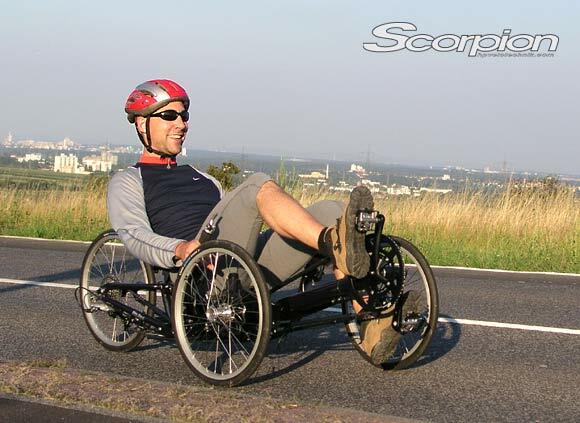 2006: HP Velotechnik develops their first recumbent trike — the Scorpion. PBW immediately brings them into the fold and becomes a premium HP Velotechnik dealer. 2005: ICE shifted focus from the custom trike business to a broader spectrum market and signed up its initial dealer network. PBW was at the top of the list and immediately became one of the top ICE dealers in the world. 2003: Paulo Camasmie’s Catrike manufacturing business came online and PBW immediately brought Catrike products onto the floor and became a Catrike dealer. 2002: Hugh traded a couple of folding bike frames for a Greenspeed GTO frame and thereby became a Greenspeed recumbent trike dealer. That same year, PBW quickly became Greenspeed’s largest California dealer. 2000: at a trade show showing PBW folding bikes in England, Hugh met Greenspeed’s Ian Sims and saw and sat in his first Greenspeed recumbent trikes. It was love at first ride. 1997: Peregrine Bicycle Works (PBW) started when Hugh Kern started making custom-built folding bicycles. While learning metalworking, Hugh watched with great interest the progress of a young man named Paulo Camasmie who was developing a manufacturing system for a new brand of recumbent trikes. A year and a half and many metal-splinters and burn blisters after officially starting the business, the first PBW folding bike was shipped. Call (800) 793-3038 to place an order or make an appointment to visit and take a test ride. In store hours are 10am-5pm Tuesday – Saturday Mountain Standard Time. Special times by appointment. Recumbent bikes & trikes, Crank Forward cycles, Folding upright & recumbent cycles, and the Adaptive Cycling world. We have a real walk in full service store in Colorado Springs like you have never seen where every cycle invites you to have a seat and a test ride! Can’t make it in person? A thorough consult with CycleDifferent by phone and E-Mail will result in a cycle that truly fits every expectation. We carry Azub, Catrike, ICE, Greenspeed, HP Velotechnik, KMX, Sun, and TerraTrike tadpoles. Click the Azub image above to visit products page. Backcountry Recumbent cycles is a recumbent specific cycling shop. Our focus is toward serving the needs of the touring recumbent cyclist, whether your idea of touring is a quiet afternoon’s ride on a bike path or a summer spent riding across the continent. BRC has the experience and equipment to make your human powered, self-propelled dreams come true. Tumalo Junction store, with plenty of rural roads to test ride a recumbent! Learn more about BRC HERE, and see photos. We sell ICE Full Fat all-terrain trikes! Call for information if you are a backcountry triker! We can get you set up with your own extreme terrain vehicle to start exploring your area. Barr Bike and Fitness was not only Terra Trike’s #1 sales dealer of the year but we are also the proud recipient of Terra Trike’s first Dealer Of The Year award! 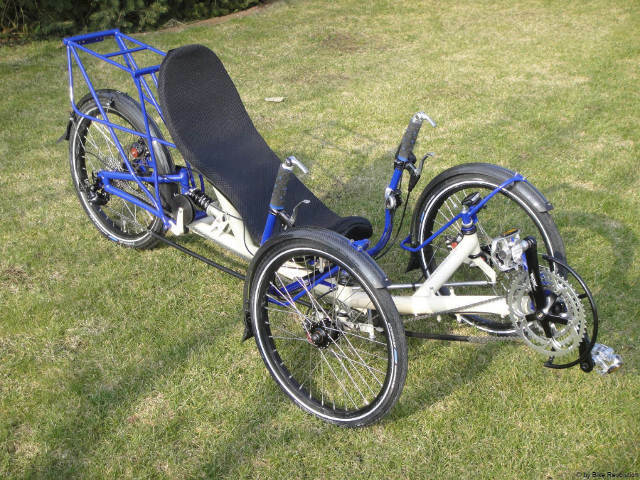 We sell recumbent trikes, parts, accessories and adaptive modifications locally in Albany, California. We offer test rides on the San Francisco Baytrail in Albany California by appointment. We modify trikes to fit many different needs – check our adaptive cycling page. ICE trikes (Inspired Cycle Engineering): Adventure, Sprint, Vortex and Adventure HD–in all their “mix and match” configurations, including non-suspended, rear suspended, fully suspended models and accessories. / Hase: Kettwiesel, Handcycle, Lepus, Trets trailer and many adaptive cycling parts and accessories. / Greenspeed: Anura and Anura Quad. / Lightfoot Cycles: recumbent trikes, Quad cycles, tandem cycles and special needs adaptions. / TerraTrike: recumbent trikes. / SUN: recumbent trikes. / Ridekick: Electric assist trailer / BionX: electric assist system. Service, repair, demo rides, and sales are Tuesday through Saturday, 10:00 am to 6:00 pm. Yes, we have a selection of recumbent trikes! 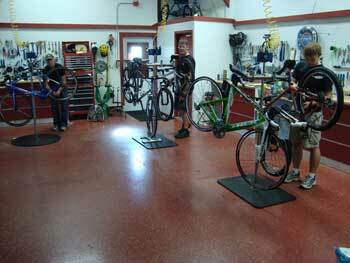 Corvallis Cyclery inc. is a knowledgable and friendly full-service bike shop. We have been in business since 1974. Corvallis cyclery Inc. is a leader in the mid Willamatte Valley when it comes to recubments, both standard and three wheels alike. We have carried, sold, and repaired several brands over the past many years. 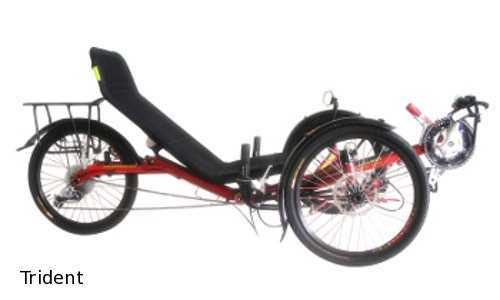 We carry Catrike quality recumbent tadpole trikes! Currently WE DO CATRIKE!! We offer a good selection of CATRIKES and select models from Sun. We offer expert repair work and full service on all makes and models. We also have a strong line of bikes from Trek, Cannondale, Electra, Kestral, Bachetta, Dahon, and custom builds through Co-Motion. We have a large repair area and experienced staff with quick turn around. Bionx electric assist conversions and custom work are professionally performed upon request. We would love to have you here as our guest and look forward to serving you. Come see us! Coventry Cycle Works is no longer is in existence. However, the business has morphed into Recumbent PDX in January 2015, and is now owned by Mel and Janet Birgé. Recumbent PDX stocks these recumbent cycles: Catrike, HP Velotechnik, AZUB, Bacchetta, Steintrike, Greenspeed, Hase, and Terratrike. Please scroll down this alphabetical page to the “R” section to learn more! Laid Back Cycles is a premier specialty recumbent trike shop located in Sacramento, Bay Area and Northern CA. Our goal is to be THE premiere trike source in all of California. We have the know-how to custom fit a trike just for you. We carry the full range of trikes from WizWheelz TerraTrikes, Greenspeed, KMX Karts, Sun Trikes, and more. 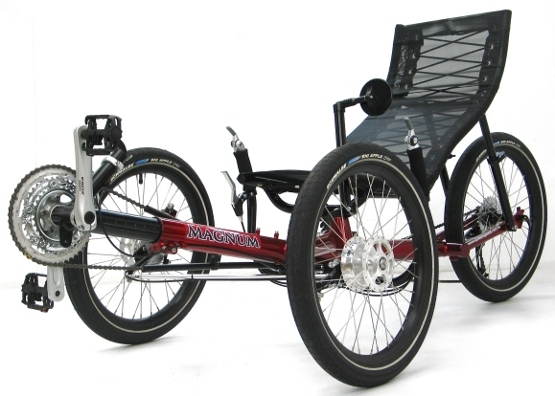 We have more TerraTrike models of recumbent trikes in stock than anyone else! We pride ourselves on being knowledgeable and easily accessible. Have a question? Just call or email! We service from WizWheelz TerraTrikes, Greenspeed, KMX Karts, Sun Trikes, Big Cat, HPV, Catrikes, HP Velotechnik, ICE Trice, Intrepid Hand trikes and more. We currently carry Sun Bicycles & TerraTrikes, and expect to add several other quality brands very soon, including ICE. Traditional upright bikes as well as recumbent bikes and recumbent trikes can be found at our store! Mike’s Got Wheels is proudly owned by Mike & Fatima Henley of Gaffney, South Carolina. We specialize in recumbent trikes. We offer custom cargo trikes and adventure touring trikes. We rent trikes, and service all brands of recumbent trikes. We have been in the trike business since 2009. Our principals have been designing and manufacturing trikes since 1981. We were the exclusive KMX Karts dealer for Oregon until 2014. We also custom build cargo trailers. Our physical shop is open by appointment only and located in Portland, Oregon USA. Please contact us about your next project. We’re Peddlers, in Heath Ohio! Actually many know us of who we used to be… We owned and operated Bike Corral, Inc. from 1980 until October of 2004 when we sold the corporation. The new owners unfortunately survived only 3 years and went out of business. After a year and much discussion, we decided to re-open a bike shop! Our store is called Peddlers, and we’re located at our old location, 605 S. 30th Street in Heath, Ohio. We carry Raleigh and Diamondback bicycles, & several recumbent lines, including ICE, Sun, TerraTrike, HP Velotechnik, Catrike, & Trident. We also service bikes and recumbents, with over 30 years of experience. Peddlers Trikes is a store that stocks, sells, services and specializes in recumbent trikes. We enjoy trike riding and hope to have the opportunity to show you the benefits of owning a recumbent trike. With our experience in the bike business spanning over 30 years, you can be assured a trike from Peddlers Trikes is properly assembled and adjusted. 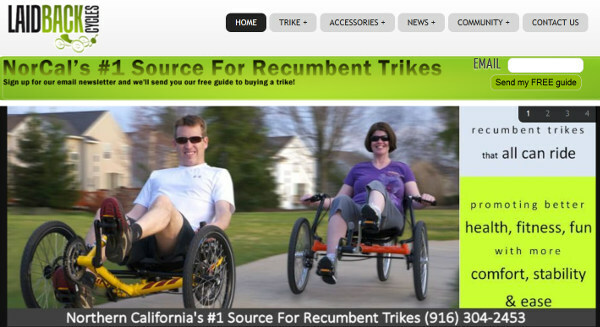 Being a specialty recumbent trike store, we carry the best trike brands in the industry. Brands such as ICE (Inspired Cycle Engineering), TerraTrike, HP Velotechnik, Catrike, Trident and Sun. At Peddlers Trikes, we keep a large inventory of recumbent trikes in stock. Our trikes are assembled and ready for a test ride on our indoor test track! With the best brands, a wide selection of accessories, and the experience to supply you with a quality built trike, Peddlers Trikes is your recumbent trike superstore. At Peddlers Trikes, recumbent trikes are our specialty, not a sideline! Store Hours: T – F 10 – 6, Sat 9 – 4, Sun: We Ride! We stock and sell Catrike, HP Velotechnik, AZUB, Bacchetta, Steintrike, Greenspeed, Hase, and Terratrike. With over 90 Recumbent Bikes and Recumbent Trikes in stock, RecumbentPDX has the broadest selection and the largest inventory of Recumbent Bicycles and Trikes in the Pacific Northwest. RecumbentPDX is a full-service retail bike shop with great mechanics and fitters, and all of the accessories you’ll need to get you out on the road. After discussing your needs, wants and budget, we’ll size your choices for test rides. Our large inventory ensures that, if you like what you test, our superb fitters can have you riding your Recubent Bike or Trike the same day! RecumbentPDX is located at the intersection of SE Hawthorne Blvd and SE 20th Ave., the location of the former home of the famed Coventry Cycle Works, and is familiar to a generation of Northwest Recumbent Bike riders. The Largest Selection of Trikes and Recumbents in the Rose City or Seattle, Washington No bike shop has more Trikes ready to test drive anywhere in the Northwest including B.C. Canada, Washington, Oregon, Montana, Idaho, Northern California and Utah. Trikes and Recumbent Bikes are all we sell and service. You can ride directly onto the local trail system which can include a relatively steep climb as well as a high speed descent. Maintained trails with a fine gravel surface are also immediately accessible. The Recumbent Trike Store presents an excellent opportunity for thorough personalized testing. While The Trike Store primarily serves the local community, we do ship trikes, accessories, and custom parts throughout the US and to Canada. There is no additional shipping charge on ICE trikes to the lower 48. Western Canada’s #1 source for recumbent trikes! For personal service call ahead for an appointment anytime. We are often asked why recumbents are better than the familiar upright bike. There is the obvious answer of a much more comfortable riding position, promoting more miles ridden. But we think the real secret of recumbents lies in where they will take you. Recumbents will take you through your neighborhood, with style and ease. They will carry you across town, or even across the country, in a safe, natural and efficient riding position. You will compete with superior aerodynamics and speed, or sit still and relax on a recumbent. Perhaps most importantly though, your first rides on a recumbent will transport you back to your childhood, when you first learned to ride a bicycle. Back to the feeling of accomplishment and liberation as… suddenly, your horizons have expanded beyond your imagination. Tuesday – Sunday: 10:00am – 5:00pm. We are your Portland Oregon shop for the BEST quality recumbent bike and trike brands. We service all makes of both recumbents and upright bikes. Our focus is on individual service – helping you get the right bike or trike for your style of riding and budget. We have a solid fleet of demos for you to try, and specialize on creating your IDEAL ride! Visit us soon. We always like to have customers make appointments when possible – it gives us one on one time with you or to even fix your bike while you wait if possible! Call us or email to make an appointment. NOTE – We are CLOSED daily for lunch from 12pm – 1pm unless you have an appointment for that time. You can find it at Rose City Recumbent Cycles. We carry KMX, HP Velotechnik, Azub, and ICE trikes! For several years, I am a fan of your website. I like the way you assemble all this info on trikes and their usage. Well, I am from Belgium, and a dedicated triker myself. I do run a trikes-only shop (Trike-Shop) in Belgium, and I thought it might be a good idea to let people know that if they would visit Europe or Belgium there is a place they can visit for all trike needs when on the road. You never know … There is already a link to your website on our website for a long time. I am official dealer for the most popular trike brands like HPVelotechnik, ICE, AZUB, KMX and we do have the expertise for repairs. This all to let you know that if on the road in Europe you’re not alone. Store Hours: Mon-Fri 9-6 (MST), Sat 10-4 , Closed Sun. Your source for recumbent bikes, trikes and velomobiles in Northern New England! Vehicles that are propelled by pedal power are part of an active, healthy, fun lifestyle and are also an environmentally conscious and sustainable way of getting yourself from place to place. Wildfire HPV is a shop specializing in recumbent bikes, trikes and other human powered vehicles. We also offer servicing and a variety of products to make cycles of all types more practical and useful.We have a variety of cycles available for test rides to help you decide which one is best for you. The HP Velotechnik brand is also available for you. The Trident Trikes brand is one of our offerings. Greenspeed’s Magnum is available through our business.